The Iron Border is a short story of 5600 words. This story is a digital premiere and has never been published previously. Like Old Mommark’s Tale, The Iron Border was written in response to the eight-hour e-book challenge instigated by Joe Konrath and continued by a bunch of people at KBoards. I don’t know if it really took me eight hours to write, format and publish the book, since I took breaks in between, but it was very quick. 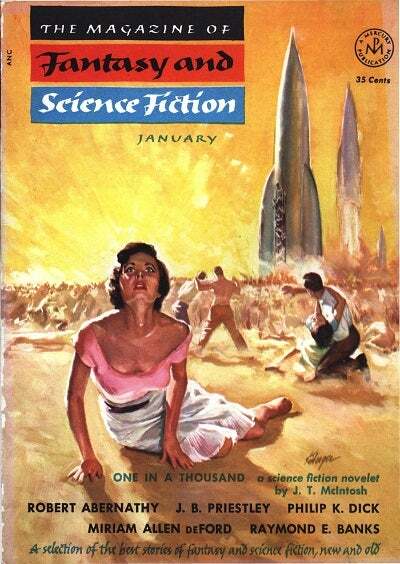 This story was inspired by this cover of the January 1954 issue of The Magazine of Fantasy and Science Fiction. I often use pictures, whether photos, concept art, old book and magazine covers, etc… for inspiration, particularly when I need a story idea on the fly. I have never read the cover story of that issue, One in Three Hundred by J.T. McIntosh, though upon looking it up, I realised that McIntosh’s idea (Earth is doomed, there are limited tickets off planet) was pretty close to mine. Only that McIntosh’s protagonist is one of the chosen few (and a white man), whereas mine is one of the millions who are not chosen and a woman of colour. Ana was obviously inspired by the desperate woman looking up on the magazine cover. I have no idea why I made her Mexican, she just was. Besides, it gave the fact that Ana had no real chance from the beginning an extra dimension. Just in case anybody thinks that I was exaggerating with regard to the border defenses, spring guns and minefields actually were used at the Inner German border in the 1970s and 1980s. The cover image is stock art by Manu Mohan.